Introduction. Covering problems. Applications. Basic Facts. Codes. The MacWilliams identities. Krawtchouk polynomials. Hamming spheres. Finite fields. Families of error-correcting codes. Designs, constant weight codes, graphs. Constructions. Puncturing and adding a parity check bit. Direct sum. Piecewise constant codes. Variations on the (u, u + v) construction. Matrix construction. Cascading. Optimal short nonbinary codes. Simulated annealing and local search. Normality. Amalgamated direct sum. Normality of binary linear codes. Abnormal binary nonlinear codes. Normality of binary nonlinear codes. Blockwise direct sum. Linear Constructions. Basic facts about linear covering codes. The case R=1; examples of small codes. Saving more than one coordinate. Davydov's basic construction. Lower Bounds. Bounds for the cardinality of the union of K spheres. Balanced codes. Excess bounds for codes with covering radius one. Excess bounds for codes with arbitrary covering radius. The method of linear inequalities. Table on K(n,R). Lower bounds for nonbinary codes. Lower Bounds for Linear Codes. Excess bounds for linear codes. Linear codes with covering radius two and three. Tables for linear codes. Upper Bounds. Codes with given size and distance. Covering radii of subcodes. Covering radius and dual distance. Reed-Muller Codes. Definitions and properties. First order Reed-Muller codes. Reed-Muller codes of order 2 and m—3. Covering radius of Reed-Muller codes of arbitrary order. Algebraic Codes. BCH codes: definitions and properties. 2- and 3-error-correcting BCH codes. Long BCH codes. Normality of BCH codes. Other algebraic codes. Perfect Codes. Perfect linear codes over IFq. A nonexistence result. Enumeration of perfect binary codes. Enumeration of perfect codes over IFq. Mixed codes. Generalizations of perfect codes. Asymptotic Bounds. Covering radius of unrestricted codes. Greedy algorithm and good coverings. Covering radius of linear codes. Density of coverings. Coverings of small size. Bounds on the minimum distance. Covering radius as a function of dual distance. Packing radius vs covering radius. Weighted Coverings. Basic notions. Lloyd theorem for perfect weighted coverings. Perfect weighted coverings with radius one. Weighted coverings and nonexistence results. Multiple Coverings. Definitions. Perfect multiple coverings. Normality of multiple coverings. Constructions. Tables for multiple coverings. Multiple coverings of deep holes. Football Pools. Constructions for mixed binary/ternary codes. Tables for mixed binary/ternary codes. On the early history of the ternary Golay code. Tilings. Preliminaries. A sufficient condition. Small tiles. Periodicity of tilings. Recursive decomposition of tilings. Tilings and perfect binary codes. Nonexistence results. Writing on Constrained Memories. Worst case coverings and WOMs. The error case. A model for correcting single errors. Single-error-correcting WOM-codes. Nonlinear WOM-codes. Subset Sums and Constrained Memories. Cayley graphs. Subset sums. Maximal sum-free sets. Constrained memories (W*Ms). Translation-invariant constraints. Domatic number and reluctant memories. Defective memories. The error case. Heterodox Coverings. Perfect coverings by L-spheres. Perfect coverings by spheres of two radii. Coverings by spheres all of different radii. Multicovering radius. Perfect coverings of a sphere and constant weight coverings. Complexity. Basic facts about the polynomial hierarchy. The complexity of computing the covering radius of a binary code. Derandomization. Bibliography. Index. The problems of constructing covering codes and of estimating their parameters are the main concern of this book. 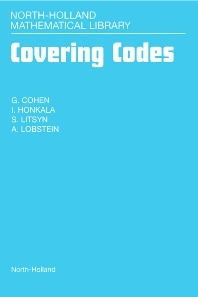 It provides a unified account of the most recent theory of covering codes and shows how a number of mathematical and engineering issues are related to covering problems. Scientists involved in discrete mathematics, combinatorics, computer science, information theory, geometry, algebra or number theory will find the book of particular significance. It is designed both as an introductory textbook for the beginner and as a reference book for the expert mathematician and engineer. A number of unsolved problems suitable for research projects are also discussed.